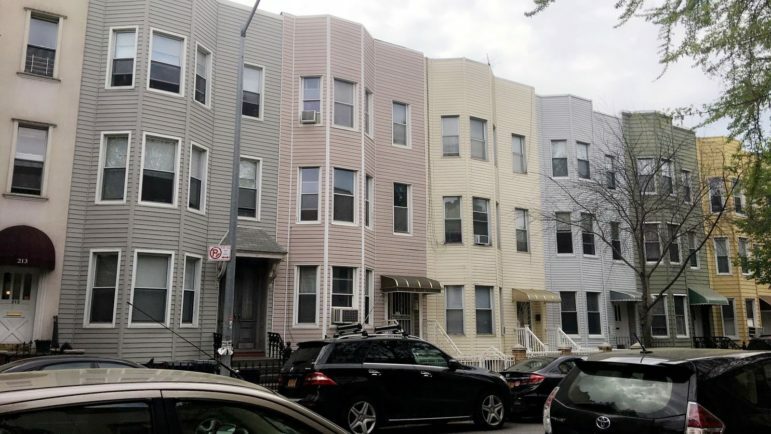 The DOT's proposal to change the direction of traffic on a portion of North Henry Street in Greenpoint was met with concerns from neighbors about more trucks using the narrow residential street. The city’s Department of Transportation (DOT) is dropping an earlier proposal to reverse the direction of traffic on a block of Greenpoint’s North Henry Street near McGolrick Park, following outcry from residents who worried the change would bring more trucks toward the green space. North Henry is a narrow street, just 30 feet wide, and once served a largely residential population. But its proximity to Newtown Creek and two North Brooklyn Industrial Zones means trucks headed to and from the Brooklyn-Queens Expressway frequently use the roadway. Residents complain about the noise, speeds, size, and safety of the trucks. Earlier this spring, the DOT had proposed reversing the direction of traffic on North Henry Street between Greenpoint Avenue and McGolrick Park—currently a one-way northbound street—so cars head south instead. The proposal is one of several included in the city’s North Williamsburg Traffic Study, which was first presented to the community in April. All the proposals in the study are aimed at improving traffic flow and safety, the plan says. The southbound conversion was initially proposed to take place between either from Greenpoint Avenue and Norman Avenue, or from Greenpoint Avenue all the way to Nassau Avenue terminating at the park. But that latter plan spurred criticism from residents worried that having trucks headed south towards McGolrick Park could be a danger to bikers and children playing outdoors, and neighbors petitioned the DOT to stop it. “A lot of kids are coming to the park. It’s very dangerous. What are you doing?” one resident asked DOT representatives at a Brooklyn Community Board 1 meeting in April. William J. Broderick, a North Henry Street resident for more than 30 years, started a petition to stop the DOT from implementing the change. Broderick says he’d collected signatures from many homeowners on his block. “Everyone is behind me on this,” he said, adding that he even had someone serve as a translator to explain the petition to his Polish-speaking neighbors. Grace Lu, a mother of six who lives near the intersection of North Henry and Nassau Avenue, is among those who signed the petition, saying she worried about the safety of her children. “This just increases the fear of accidents and fatalities for family members, elders, and my neighbors,” she said. In response to those complaints, the DOT said it no longer plans to change the direction of traffic on North Henry Street between Nassau and Norman avenues—the block directly north of McGolrick Park, a spokeswoman for the agency told City Limits this week. “After community input and further review, DOT is no longer pursuing a direction change on this block,” the spokeswoman said. However, the DOT is still proposing to change the direction of traffic on the portion of North Henry Street further north, between Greenpoint and Norman avenues, turning those blocks from northbound to southbound streets, according to the agency. Brooklyn CB1’s transportation committee voted unanimously in favor of that plan last week, according to the DOT. But the full board will still need to vote on the proposal at its monthly meeting on June 12, the agency’s spokeswoman said. The DOT stated that while the North Williamsburg Transportation Study is complete, there is no timeline yet for when its proposals will be implemented. “We are still taking feedback and will continue to have public forums/meetings on the study,” a DOT spokeswoman said in an email. This article was produced by a New York City student journalist enrolled in City Limits Accountability Reporting Initiative for Youth (CLARIFY), which is supported by the Pinkerton Foundation. The NYCDOT is an out of control virtually unaccountable city agency. Bravo to the residents of Greenpoint for putting the DOT in it’s place. The DOT is the city’s worst nightmare. Randomly changing traffic flow and light timing with out any regard to the actual living humans that it effects. Worse than NYCHA.